Alexandria criminal court has sentenced two policemen to ten years in jail for killing Khaled Said. Awad Saleh and Mahmoud Ghazala were found guilty of torturing Said to death in June 2010. Defence lawyers said they would appeal the verdict. Scuffles broke out in the courtroom between security guards and the defendants' relatives after the presiding judge said only lawyers and media personnel could attend the session. "We were expecting heavier sentences for the killers, we now leave it up to God," Zahraa Said, the victim's sister, said via Facebook. In October 2012, the two policemen were sentenced to seven years in jail for the illegal imprisonment and torture of Said. Both prosecution and defense appealed the original sentence. The verdict was also rejected by political activists and Said's family, who said it was too lenient. Speaking to Ahram Online in 2012, Said's lawyer Mahmoud Afify explained that under Egyptian law a member of the police beating someone to death is automatically classified as "torture" and leads to a heftier sentence of 15 years because officers are "expected to know better." Said, 28 at the time, was reportedly targeted because he possessed video footage of police sharing the spoils of a drug bust. His killing was followed by nationwide protests against police brutality, which had spiked under Hosni Mubarak and interior minister Habib El-Adly. Said became a symbol of police brutality. 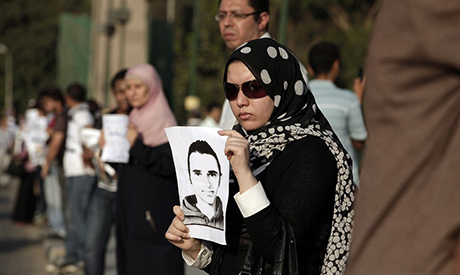 His death highlighted the injustice of the Mubarak regime and resonated especially among young activists and bloggers. The 'We are all Khaled Said' Facebook page motivated many Egyptians to protest for "Bread, Freedom, Social Justice, and Human Dignity." In January, eight activists were handed two-year prison sentences and LE50,000 fines for protesting without a permit during the Khaled Said trial in December 2013.
his is the Justice System in Egypt.. to much time, to many appeals, and not the right sentence. They should be serving life or at least 25 to life without the possibility of getting out. Too many pepole get away with meaningly murder that are not punished correctly for. The police terrorists who killed Khaled Said definitely should be imprisoned. The same needs to be done with the rest of the Mubarak criminals. Though the sentence is insufficiently harsh and not long enough. It is strange that brutal murdery is treated so lightly. To many barbarians who fought against citizens both before and after 2011 after still on the loose/prowl.